A private conversation between the feuding men of the Yankees franchise. A-Rod: Don’t worry, Brian. I told you: no one will see you here. Cashman: Your record isn’t exactly perfect. A-Rod: It’s the girls—they always talk. Cashman: We have to settle this, Alex. A-Rod: I know. This is a bad look for us. Cashman: We can’t pay you all that money. A-Rod: But I have to get some of it. Cashman: I’m exhausted, Alex. I’ve been begging Bernie all day to unretire so that he can hit at the bottom of the lineup. You tell me what we should do. A-Rod: Here, have a cronut. A-Rod: Look, I know I’m going down with this steroid thing. I’m willing to throw the case and take the suspension this year. Cashman: Yes, but that’s only 15 million dollars we save. I’m going to need more than that. A-Rod: You know the saying, “wait until next year”? A-Rod: Who’s to say that I don’t get injured next February? Cashman: So we’ll get the insurance money? Cashman: Why are you doing this? You’ve always had so much pride. A-Rod: I realized something recently. Over the Fourth of July Weekend, I realized that this is America. I’ll pay for my mistakes now, and then I’ll disappear. I won’t embarrass myself like Barry Bonds or Roger Clemens. Time will pass. In the meantime, people can question the Chris Davises of the world for using steroids. Then, in a few years, people will start remembering how great I once was back in Seattle or even Texas. I know I won’t get into the Hall of Fame anymore, but if I shut up and disappear…there’s always a chance people will remember the good things right? Cashman: Alex, I don’t know what to say. 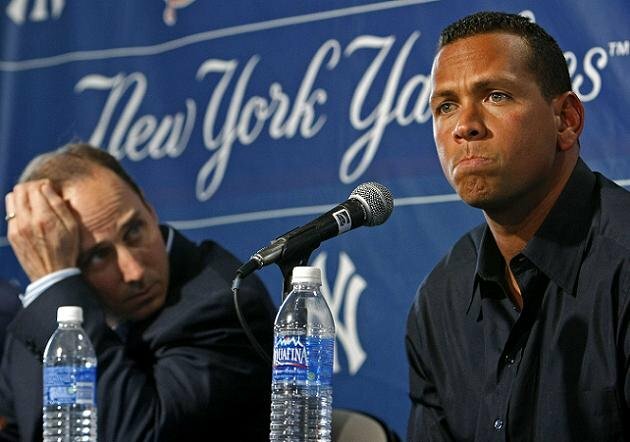 A-Rod: You don’t have to say anything, Brian. I happened to get some good advice from a guy who knows about these things. And, hey, the Angels are just as bad. Now Pujols’ contract looks even worse than mine! Cashman: You can say that again! Why don’t you have the last one? A-Rod: I just want to go and say hello to a friend. A-Rod: Oh, just former governor Spitzer. Cashman: Now, how am I going to get rid of Teixeira?